I was contemplating for a long time what ideal military situation would be appropriate for the system. Then I believe it was the Pointe Du Hoc scene from The Longest Day movie that made that situation click for me. The IMS system is built around simulating attacks that seem, on their face, to be impossible or suicidal endeavors. 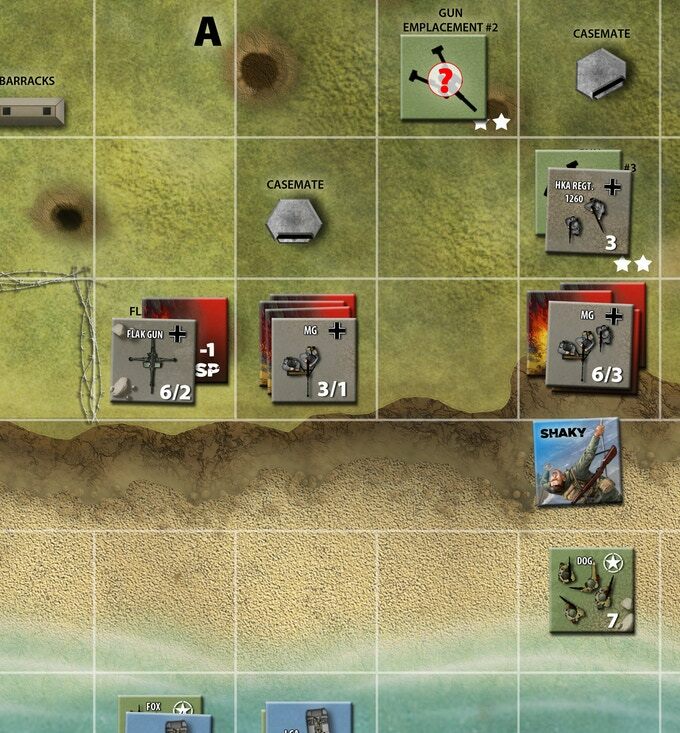 Well the Pointe Du Hoc assault apparently clicked all the right boxes. 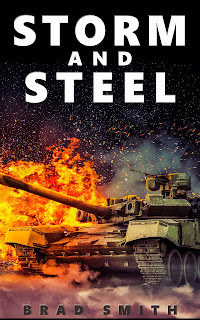 When I continued with further research into the detailed particulars of the battle, it developed into a much deeper and even more interesting story than I originally imagined. 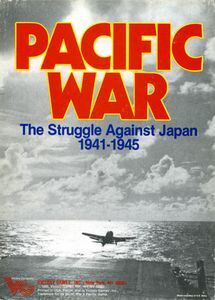 I decided then that this was the perfect next topic for this system – it was an iconic WWII battle that occurred as part of the D-Day landings (a popular gaming topic), undertaken by a legendary military formation and involved that formation accomplishing multiple missions in a short amount of time ... all wonderful gameplay fodder for the IMS system. Can you give me a brief rundown of how the game plays? 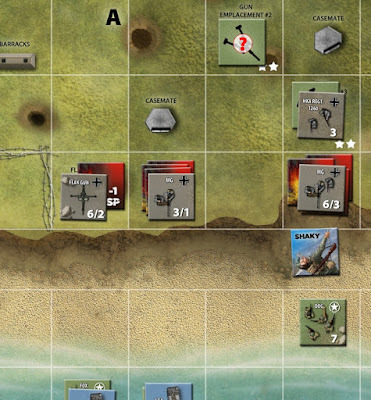 The player(s) will have a number of Ranger units organized into the three historical companies that attacked Pointe Du Hoc (Dog, Easy and Fox companies). You choose a company and then select one of its units to activate. By the way, each unit represents a group of about 20 soldiers. Activation normally involves rolling one or more Movement Dice for that unit and applying the rolled result. But there are four dice to choose from, each of a different color and each carrying a different risk/reward ratio of results. You can start “safe” with the Green die (which has few chances of casualties but also allows less movement) or go full risk and roll the Black die (lots of casualty and morale loss possibilities, but also the most possible movement) or any combination thereof. But each colored die can only be rolled once per unit – once used, you must then choose a different die to roll. The more you move forward, the better the progress towards your goals but the more risk you then take on as the unit starts to outrun its support. If you happen to roll a “Stop” or worse, the unit will be stuck in its last position and is done for the turn. It could also suffer casualties equal to the distance it is from its rally point, so the harder you push the more possible losses the unit will take. The dice handle most of the German combat effects, inflicting “friction” hits on the Ranger units as they move and get certain results. 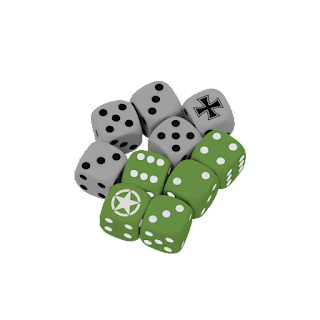 Some of the dice results also cause morale effects and even force the player to draw Event Chits, which can be good or bad for you. These will create independent, historically-based events to occur which will involve everything from German bombardments and counterattacks to Ranger reinforcements landing. Add to this the occasionally required drawing of Event Cards, which act as a random timing mechanism. 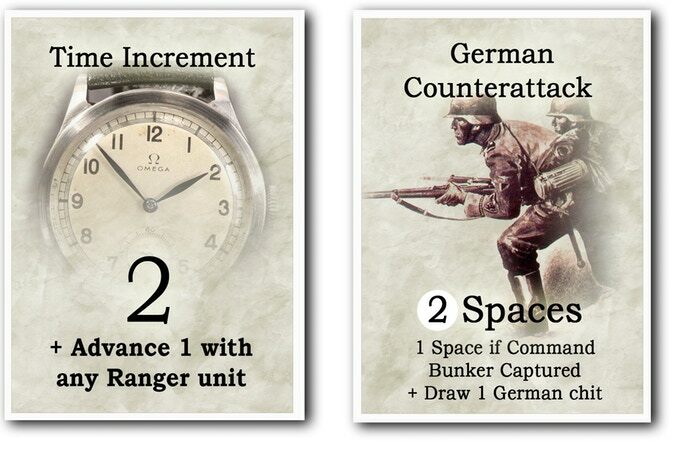 These cards can invoke the passing of game time (Time Increments), the preparation and timing of German Counterattacks or the progress of the relief column on its way from Omaha Beach. So the player must constantly mitigate the risk with the rewards and “push his luck” as much as he sees fit. The object is to defeat German forces, find the hidden German artillery pieces that threaten Omaha and Utah beaches (these could be in many different places), setup roadblocks on the highway to hold up the German reinforcements and to withstand numerous organized German counterattacks. When the third day ends – or the relief column arrives - the game ends and the player will add up his Victory Points to see how he did. How has the game evolved during development? At the start, I used the original IMS game as the starting point. But I quickly realized that it would need some updating and more specifically, it had to be made more user-friendly and play more smoothly. I knew that Crowbar would be a much bigger game, physically and scope-wise, and I also knew that I wanted to make the game more appealing to the greater gaming public. To that end, the first mechanic I dropped from the original was the d6 Dice Matrix for determining movement. I opted instead to go with custom icon dice in order to remove the need to constantly check the chart for your movement result. Luckily, Mark Walker totally agreed with my decision, as he also is on a mission (from God!) to make our wargames more palatable to all gamers. Once we started down that path, the counters grew to typical Flying Pig Games 1” squares, the map became much more spacious and the old CRT and modifier-heavy combat mechanism graduated to a much simpler Combat Dice system. In addition, a certain “exploration” aspect to the game blossomed in that the player could not only discover the much-sought-after hidden guns, but he would also encounter other historically-based surprises. Also, I decided to add a cooperative and multi-player mode to the game so that larger groups of gamers could enjoy the game together, something that I think all wargames need to do more of. So the design really did evolve in many constructive ways and all in an effort to make the design more attractive to a more diverse pool of gamers. What were your inspirations when designing the game? Well, as you know Crowbar grew from a desire to do another IMS style of game. In addition, solo games are becoming more popular than ever, as are multi-player and cooperative games. So I wanted to take advantage of both those factors. The system itself was inspired by a simple push-your-luck dice game that I played with my grandmother when she came over from Germany. It was called “Schwein” (or “Pig” … no, not “Flying Pig”) and I remember the intense drama of deciding whether to roll those dice again and risk a “snake eyes” or stop and take what I had accumulated to that point. So I wanted to emulate that kind of gut-wrenching and just plain fun decision making in a wargame setting. So marrying those kinds of chance dice rolls with the movement forward of a military unit, while also then including the enemy’s “wall of fire” into that result, made sense. It removed the need to conduct the enemy’s turn as a separate, time-consuming combat resolution. The concept of Rally Point markers then was used to set the unit’s start point and from which the increasing risk of an unsupported advance could be measured. This also made thematic sense in an abstracted way and it all fell into place very nicely. As far as this design is concerned, the attack at Pointe Du Hoc really represents an almost perfect historical situation to allow this system to “do its thing”. What do you think players will learn from playing this game? As with most wargames, I would hope that players gain an appreciation for what these men had to go through to accomplish what they did historically. Obviously, no game can truly simulate the horrors of war, but we can at least try to show people the elements that challenged the real life participants. 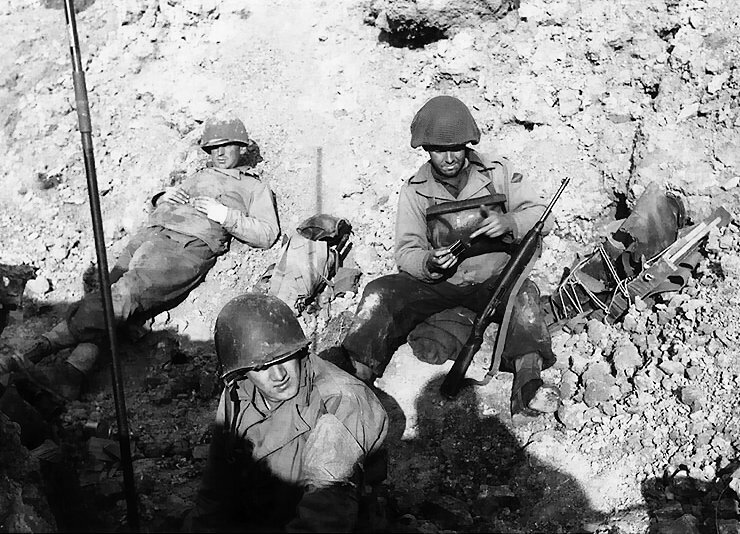 As far as Crowbar itself is concerned, the Pointe Du Hoc assault was truly a “mission impossible”. In fact, one officer remarked that “three old women with brooms could sweep us off those cliffs!”. So aside from having a fun, tense gameplaying experience, I did also design the game to include many historical events so that players will feel like they are part of the Rangers and suffering through the same action and making similar types of tactical and strategic decisions. What was it like to try and accomplish an impossible mission? I’m hoping that players will have at least gain some kind of concept of what a brave and amazing accomplishment this was by the 2nd Ranger Battalion. So I did make a point of including as many of the actual events, conditions and units that actually did take part in the three-day battle to players would learn what actually happened on top of those cliffs. But I also added a few elements that did not actually happen, but that could have happened. For me, that rounds out the “simulation” portion of the game design very nicely. How do you think your designs have changed throughout your career as a game designer? As I may have hinted at already in the previous questions, I am really trying to draw more people into the wargame end of the gaming hobby and to do that, I’m trying to develop and utilize mechanics, procedures and rules that will not be as off-putting as many traditional wargames mechanics. I have always tried to design non-traditional wargames about unique topics – that’s why I got into designing in the first place - but many of my early endeavors still relied on more of the classic “wargamey” gameplay styles. As I’ve progressed in design style, spoken to more people and been exposed to more games of all kinds, I realized that the main barriers for the general gaming public is the process-heavy mechanics of most wargames along with their rather drab and confusing physical presentation. So with those revelations, I have really tried to get wargaming to be more acceptable and attractive while at the same time, telling my wargaming friends that it’s really OK to play Ameritrash and Eurogames because there are some absolutely brilliant designs out there! And that’s another part of my evolving design philosophy – to learn from other designers of all stripes. There are so many elegant and clever mechanics in other styles of games that can be adapted to wargames and I am educating myself to bring those design mechanics into my own creations. If it works for those games then I’m confident that I can make it work for wargame designs as well. Well if Crowbar is popular and gamers enjoy that kind of approach, we’ll be on the hunt for another historical battle or campaign that this system can work for. I’m inclined to look at something of a larger scope so that the game has a different feel to it and is not just a rehash of Crowbar and IMS. One thought was the Verdun campaign of 1916 where the player would play the German forces as they race against the clock to defeat or “bleed white” the French forces around that fortress complex before they are reinforced and supplies run low. I’m also discussing with Mark the possibility of me doing a military science-fiction version of this game. The player would play a force of Galactic Marines as they travel from planet to planet assaulting alien strongholds before the aliens can obliterate the planets. Now that would be fun to design for sure! So there are a number of possibilities for this system and I look forward to designing them and hopefully making then successful for Flying Pig Games.